May 20, 2013. Ian Holzmacher advises Wanderlust is sold - this time, for real. Fortunately, his DFI status, a life time appointment, continues. Fair Winds, Ian! And Welcome to new owner Mimi Benach! We stand by for Mimi to check in. Well as of today I'm Dolphinless. Wanderlust has been sold to Mimi Benach, who plans to keep her berthed at the boat yard where I have hauled her the last two seasons in Amityville. Just under 10 miles west of her previous home port. Also she plans to keep the name. My family is currently in the process of upgrading from a Morgan 30 to a Pearson 35. 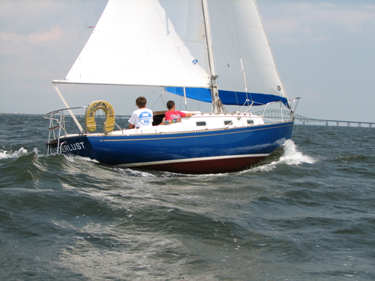 So I will still be able to get out cruising the Great South Bay. Webmaster Note February 19, 2016 - We have not heard from WANDERLUST's new owner so we asked former owner and DFI Ian Holzmacher for a report. Here's an excerpt from his email. Glad to hear from you. Mimi has been using Wanderlust from what I hear. 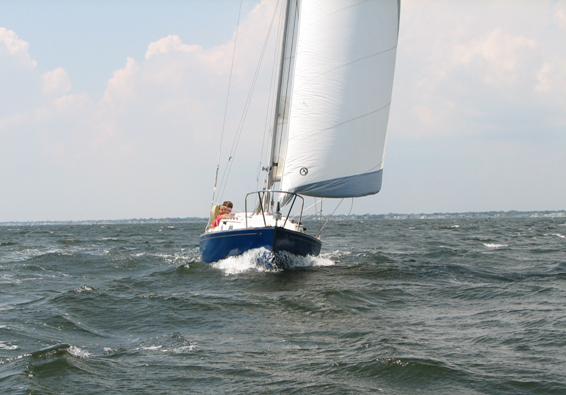 I teach sailing lessons in Sayville and often sail up the creek Wanderlust is berthed in for the summer - which is in Patchaugue. April 22, 2013. Ian Holzmacher advises that WANDERLUST is still FOR SALE as the previously reported pending sale did not go through. February 7, 2013. Ian needs to get himself a drivers' licence and a car, so Wanderlust is up for sale. Here is his email and ad. I have come to the conclusion that I'm now getting close to getting my drivers licence, and will be needing to buy a vehicle. So I have decided to sell Wanderlust. Although I do love everything about the her, and have had many great times on her! I probably wont have much time for her this summer. 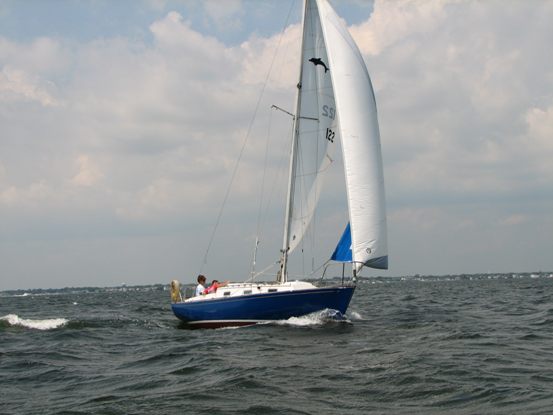 I'm not sure how you layout the for sale listings so I've provided a list of improvements since I bought her in 2010, as well as a list of equipment. I've included a picture of the interior. Sorry for the leaves on the galley table. She isn't missing anything. I've sailed her for the past 2 years with several overnight trips and can't think of anything that she needs. This following is the chronological record of Wanderlust on this website. On November 24, 2010, Ian Holzmacher checked in with Yankee # 122. 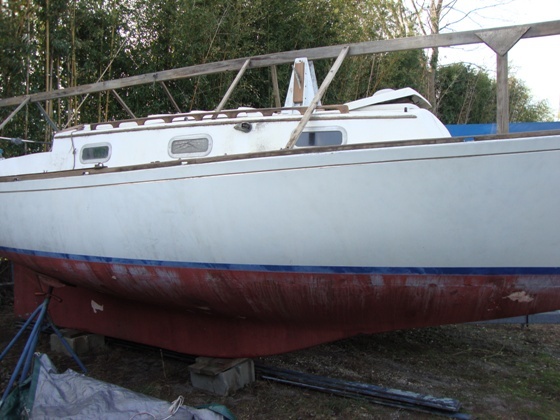 We had no record of this boat so she is a 'newly found Dolphin", our 170th. We'll try and get more info about her. 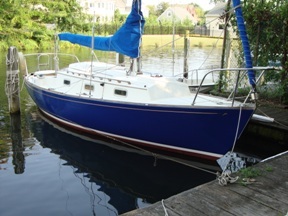 I have just recently acquired Yankee Dolphin # 122 In Babylon New York. 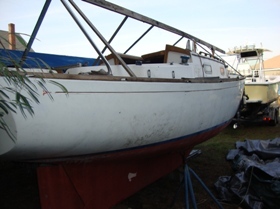 I don't know any of the history of the boat other than that she has been sitting out of the water for the past 5-6 years. She is in good condition other than needing cleaning,sanding and refinishing the woodwork. I am hoping to launch her this spring with the name of "Wanderlust". I thought this would be of interest to you and please add her to the roster on the web site. Thanks for the web site it has been a great help. 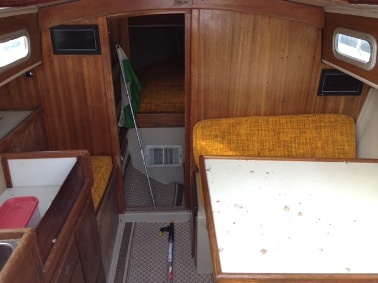 I have included several pictures of the boat. November 25, 2010. Some history about #122. Thanks for adding "Wanderlust" to the roster. I bought her from John Kelleher. I believe the original owner was James Heacock. I found two names but I don't know what owner goes to what name. They are ''Jimel'' and ''Lily Belle I" . 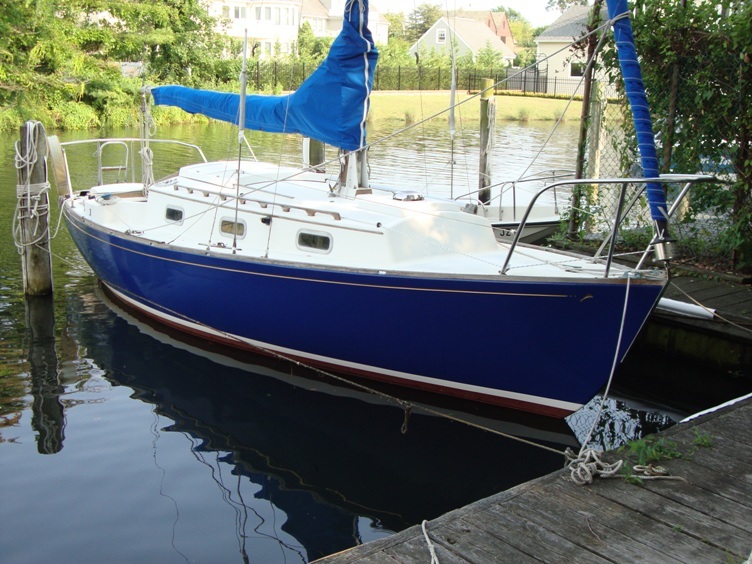 She was bought new from Doug Westins Boat Shop Inc. in Sayville New York.She was ordered on 9-18-69 and she was delivered on 4-1-70 for $6,450 . 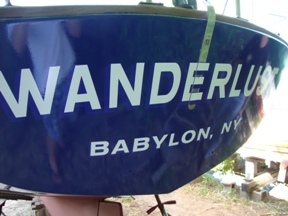 Wanderlust's home port will be Babylon, New York. 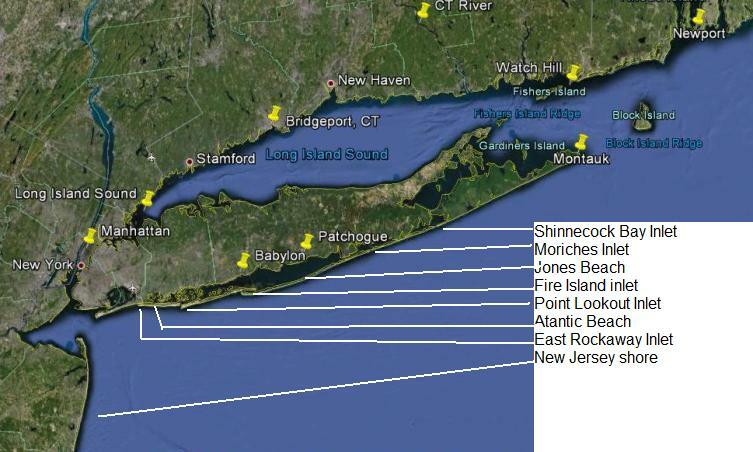 January 10, 2011, Ian checked in with some additional infornation about #122's history based on discoveries in old Great South Bay Cruising Club yearbooks. To see Ian's full email go to Nalana Kai. Here are the excerpt's that apply to #122. I have also confirmed the names and owners of my boat #122. February 1, 2011. Ian sent in an email and the following pictures of #122 taken when he replaced her cover this past Fall - he must have foreseen that we would get record snow this winter! Thanks for adding the pictures. 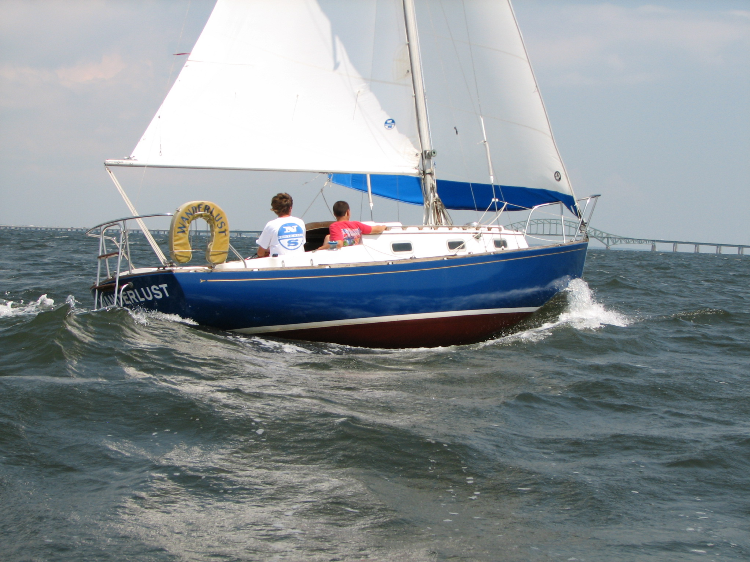 Hopefully this May or June I'll have some pictures of "Wanderlust" sailing. I've started to refinish pieces from the cabin and cockpit. 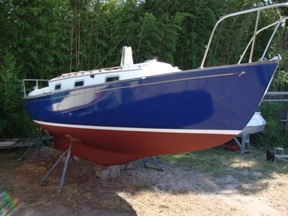 In April I will scrap the paint off the bottom, repaint the bottom red and sand the topsides. The topsides will be painted sapphire blue with Interlux's topside polyurethane paint, with a white boot strip. The new cover is holding up well other than in the first blizzard the stern pulpit punched two small holes on each side of the cover, which I patched with duct tape. After each snow I go up and knock all of the snow off the cover. Next winter I'll try to get a better cover. August 7, 2011. Ian sent in the following update. Wanderlust Is ready to go. After months of work she is now in the water, rigged, and ready to go. She was launched this past week. I haven't had time to take her out yet. Maybe tomorrow if the weather cooperates. 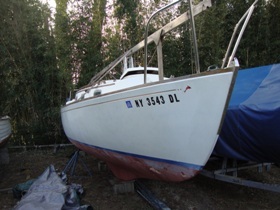 I have attached several pictures of the process out painting and barrier coating her. 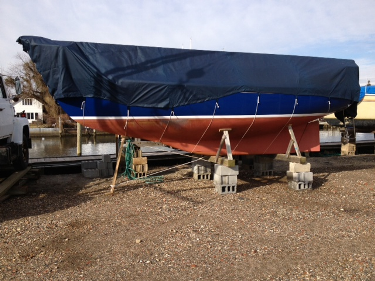 Tomorrow I'll try and get some pictures of her in the water and maybe even sailing. August 10, 2011. 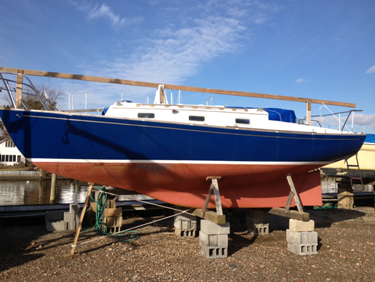 Final topcoat, launched and sailing!! Nice job - congratulations Ian!! 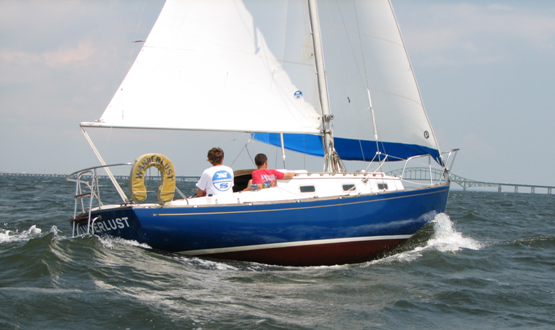 August 11, 2011 - super sailing photos! Wanderlust is sailing on Great South Bay on the south shore of Long Island. 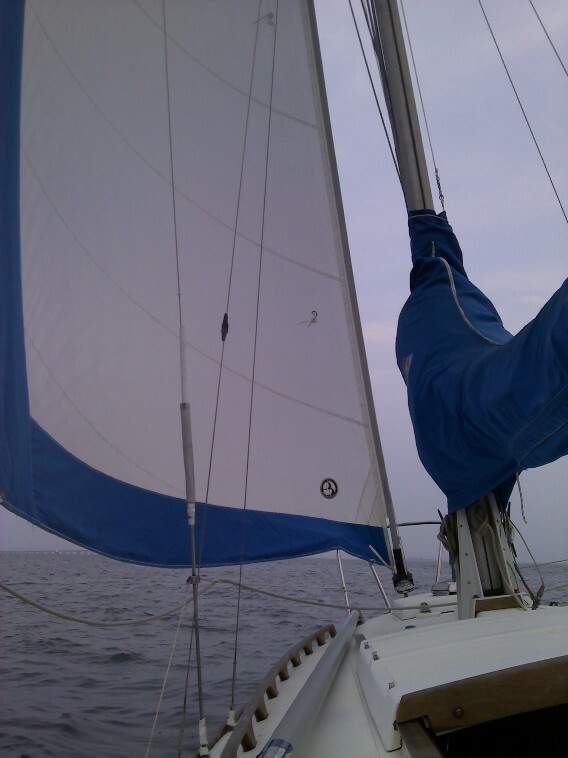 Today I went sailing again on "Wanderlust". It was the first time I had both the main, and genoa up. I had a great time, she attained hull speed very easily. 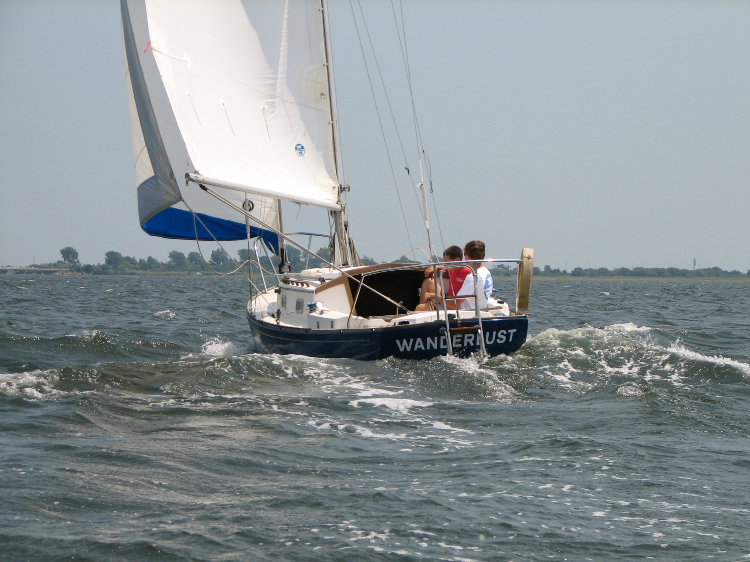 I have also attached several pictures of Wanderlust sailing. Sorry it has been so long since I have last updated you on Wanderlust. 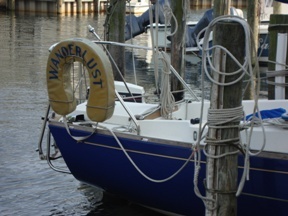 At this time Wanderlust is on the hard at Yacht Service Ltd. in Amityville, New York, sporting her new winter cover, I have included a couple of pictures of her at that location. Fortunately she made it through Hurricane Sandy without even a scratch, riding it out in a wide slip behind my house with a lot of slack in her dock lines. The tide came up 4 feet above the average high tide. The house didn't fare quite as well, but we're now moving along on the road to recovery. Hope you and your family enjoyed a wonderful holiday, have a happy and healthy New Year.